Governor Andrew M. Cuomo today broke ground on the Jacob K. Javits Convention Center expansion in Manhattan’s West Side. 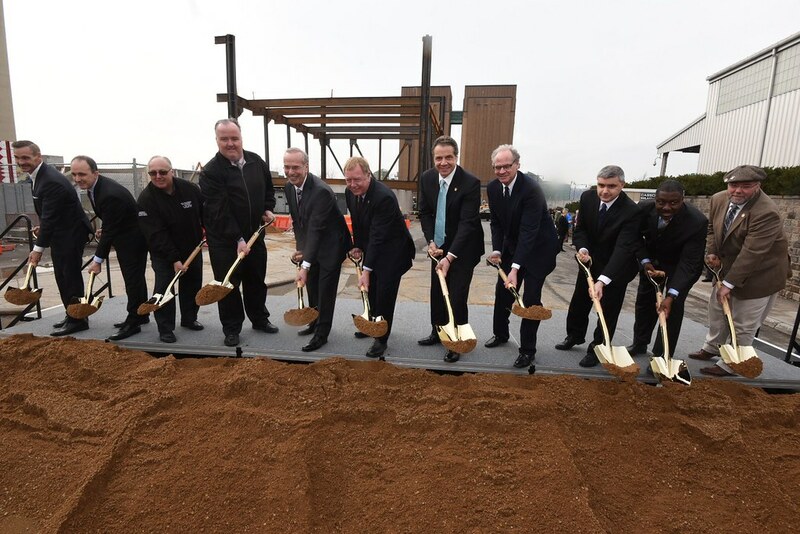 Following work that began on the building’s foundation in December 2016, this groundbreaking signifies the start of construction on the first phase of the $1.5 billion expansion project. Workers will begin to raise steel beams for the transformer building, which will provide power to the new Javits Center expansion. This early start will enable LendLease Turner, the construction consortium that was awarded the design-build contract last month, to jump-start work on the expansion. As the first phase of construction, the transformer building will be comprised of elevated, enclosed platforms and will be built over the Javits Center's existing transformer yard above the flood plain in order to meet the increased electrical demand of the expanded building. The building will consist of a structural steel frame with two supported levels and the floors will be concrete slab on metal deck supported by steel beams with composite studs. The foundation system consists of six straight shaft caissons that were drilled into the underlying bedrock to avoid underground utilities and the equipment of the existing transformer yard, which will remain in operation during the construction of the new transformer building. "The Javits Center expansion is creating thousands of construction jobs and supporting the growth of New York’s hotel, restaurant and tourism industries for decades to come." The building's roof level will have a horizontal canopy intermixed with green-screen elements and planters that support climbing vines. Acoustic panels will also be placed intermittently along the north edge of the building roof to mitigate rooftop unit noise. In January, a design-build team was chosen to lead the expansion project following a rigorous evaluation process utilizing five technical committees to evaluate competing proposals in five areas: proposed design; project schedule; project plans and approach; MWBE/SDVOB approach; and the bidding team’s experience and financial strength. A sixth committee evaluated the bidders’ financial proposals, and a selection committee, comprised of government and industry leaders, received the committee’s evaluations and chose LendLease Turner as the design-build team, with TVS as the design firm. In addition, Tishman Construction and Lehrer LLC, both chosen through a Request for Proposals, will assist the convention center development corporation in managing the project. The panel's recommendation was approved by the Board of Directors of the New York Convention Center Development Corporation, a subsidiary of ESD that owns the convention center's property, oversees major construction work at the facility, and issued the Request for Proposals in June 2016. $1 billion in funds for the project have already been appropriated and proceeds from bonds sold last year by Empire State Development will finance the balance. The expansion also builds upon the building’s recent renovation, which included the installation of new façade, flooring, mechanical and sustainability systems, as well as a 6.75-acre green roof that has become a sanctuary for area wildlife. Under this project proposal, the expansion will help attract large-scale, high-spending, trade shows and conventions, while enhancing the quality of life for Manhattan communities. In addition, the construction of an on-site truck marshaling, loading and storage facility will reroute 20,000 annual event-related trucks off public streets each year, improving neighborhood traffic flow and pedestrian safety. As a result, the move-in and move-out process for events will be reduced by 30 percent, leading to an additional 20 days for new events and additional economic activity. New York State AFL-CIO President Mario Cilento said, "We commend Governor Cuomo for his continued commitment to create good, solid, middle class jobs in our state that will give more working men and women an opportunity for a better life. This bold expansion project generates new jobs in the construction, hotel and restaurant industries while ramping up economic activity that will improve the lives and well-being of working people throughout the state." The Javits Center is the busiest convention center in the United States and hosted events on 337 days in 2015. Located on Manhattan‘s West Side on 11th Avenue between West 34th and West 40th Streets, the six-block facility encompasses 2.1 million square feet, of which 840,000 square feet is exhibition space. It hosts trade shows, conventions, and special events that spur economic activity and job creation. In 2015, the facility hosted more than 175 events and two million visitors – ultimately supporting 17,700 jobs locally and generating an estimated 483,000 nightly hotel room reservations. In total, the Javits Center had an economic impact of $1.9 billion in 2015.